As requested, I am posting the pattern for this yoke . the details of the embroidery are here. There are two parts of this yoke. 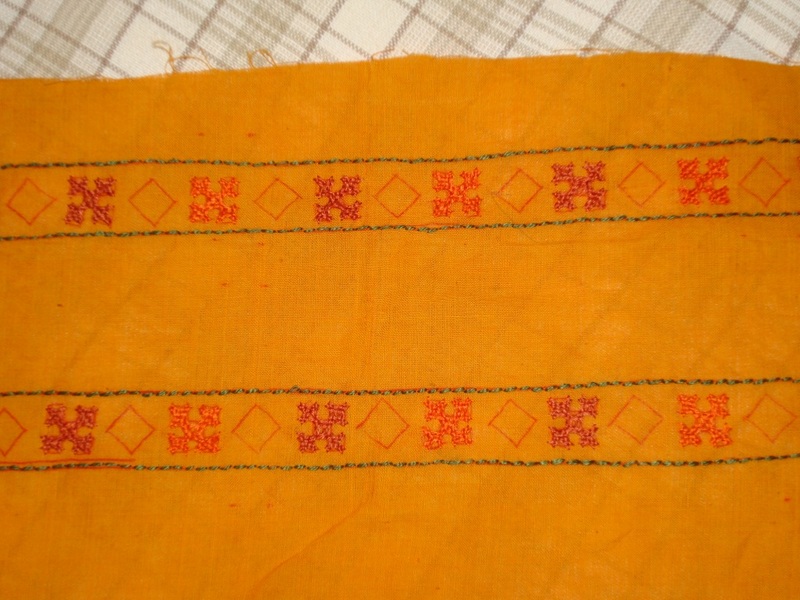 After this ,the tunic went to the hands of the tailor, where the borders on sleeves were attached as I wanted, but when it came to the yoke, he left a gap on the yellow border, which was not as I expected, I had wanted the lace to be attached at the end of the border, just as the empire cut. but……! 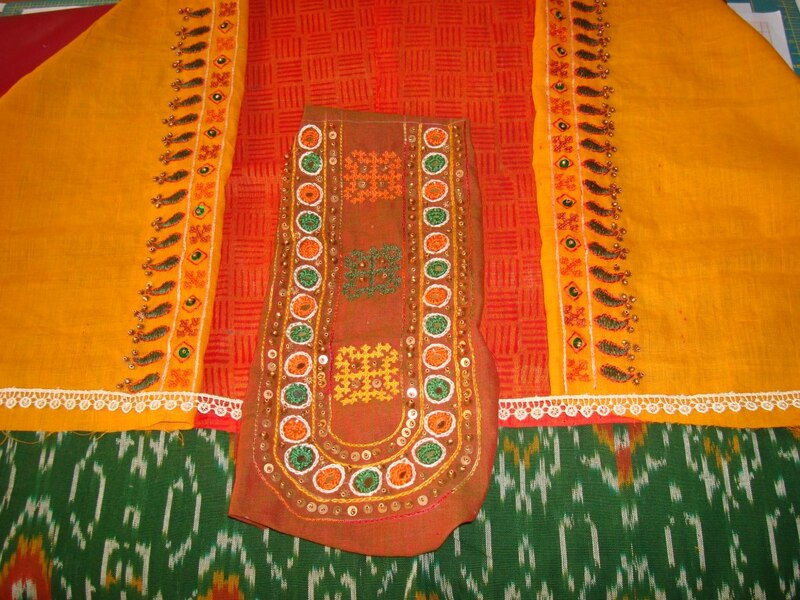 To rectify this , I worked two paisleys on the border on both sides, still this looks more like a tribal dress than a tunic top. LOL! I think these kind of designs will look better on thin or slim figures , which I am definitely not! Though the result was not I expected, the joy of working on this design gave me the contentment. I am waiting for a suitable occasion to wear it ! If anyone shows interest in the pattern of the yoke and sleeves, I can post it here. 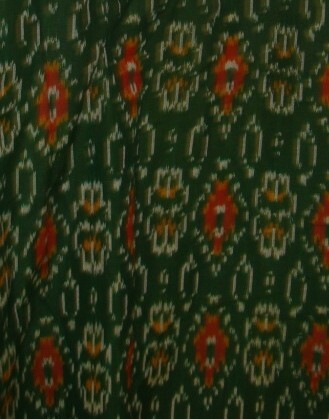 The sleeves of this tunic had borders in two fabrics. One was the brown fabric, which we have seen so far, another one is yellow fabric. The outlining of the mirrors was done in cream on this brown fabric. 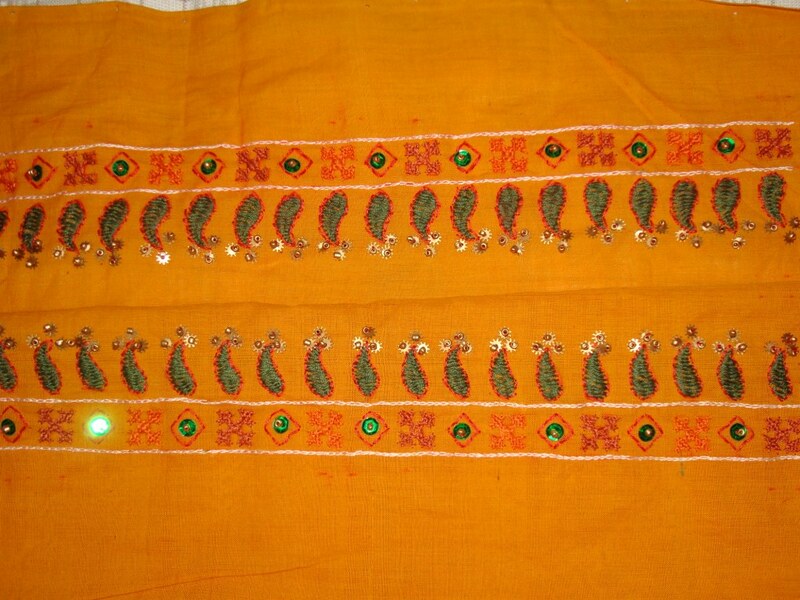 the border with sequins and mirrors stitched with green and orange threads alternatively. 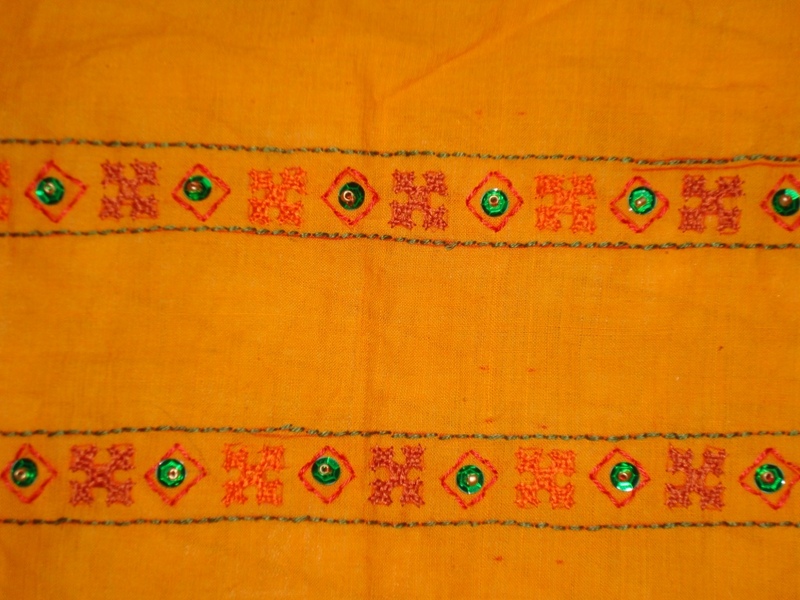 The details of the border in yellow fabric- pattern with kutch work motifs done in brown thread. 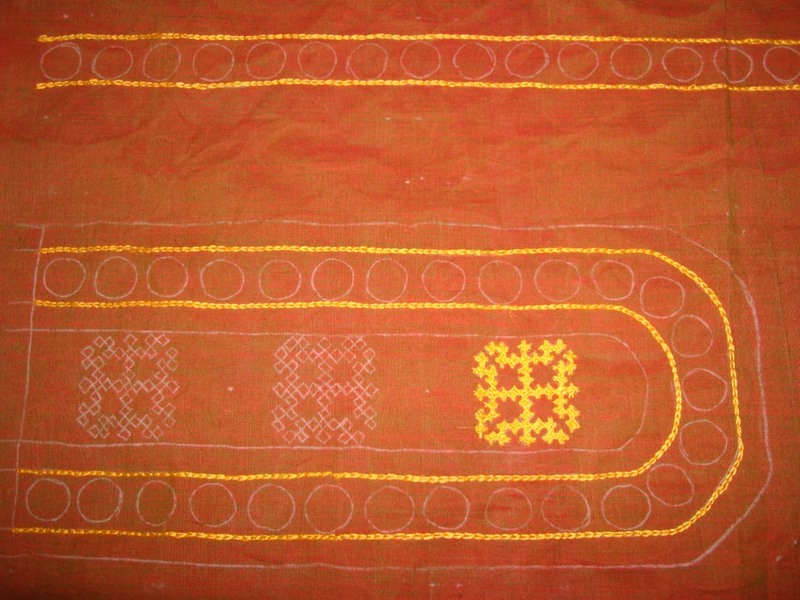 The same border after working the kutch work motifs in orange thread. 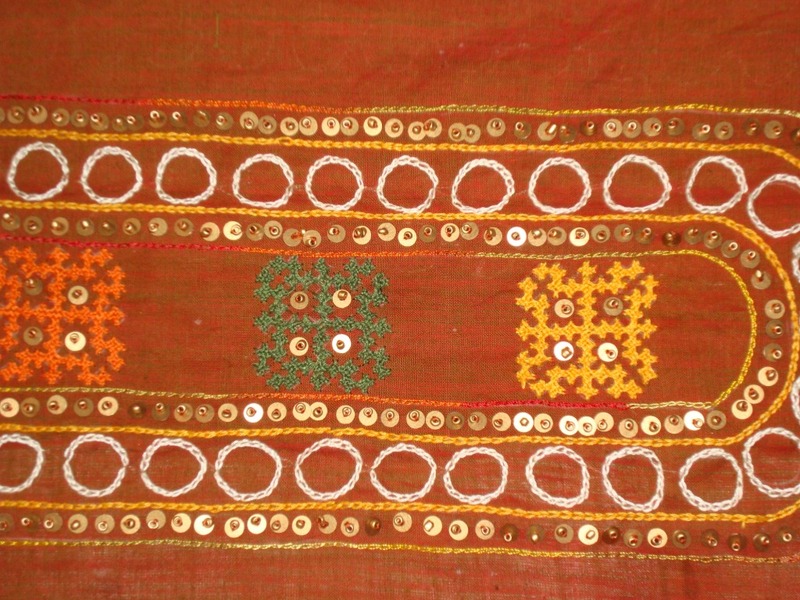 With squares done in red, with green sequins and gold beads. 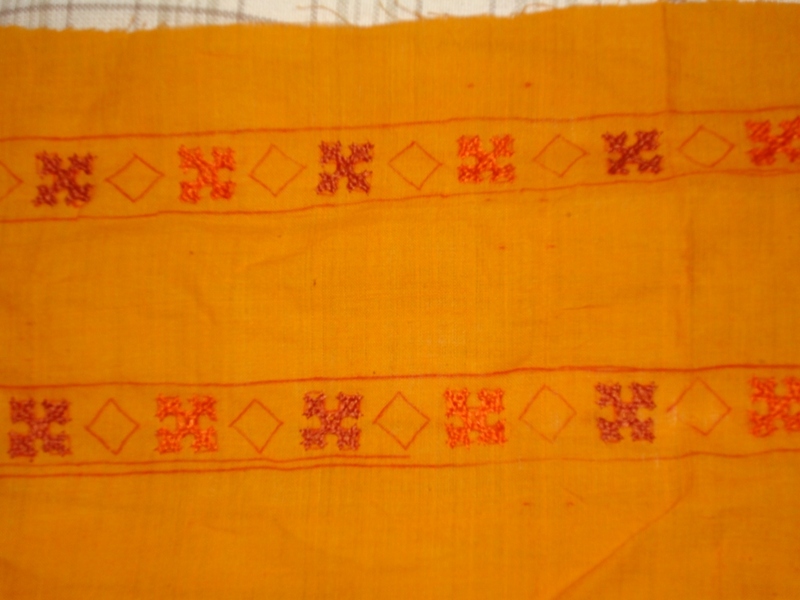 The yellow border on yoke on my next post. Further details of this multi coloured yoke. 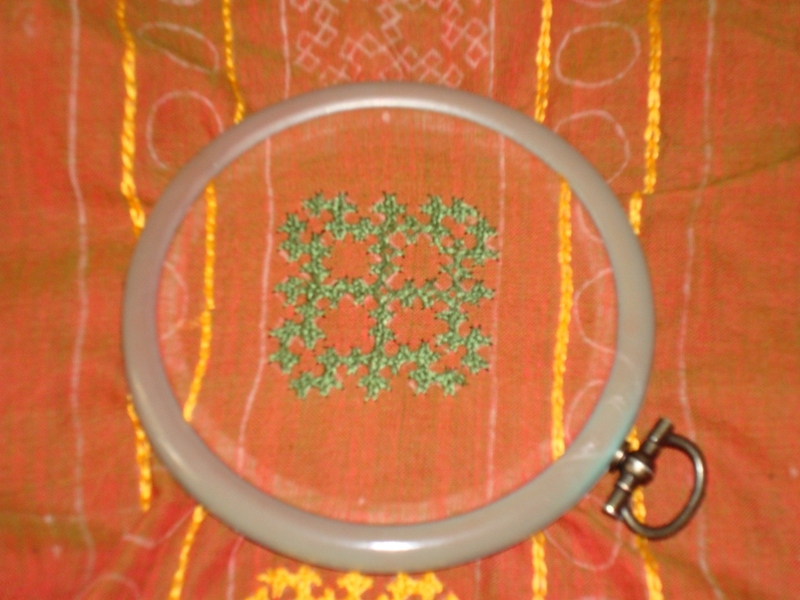 For this yoke, three fabrics are used. 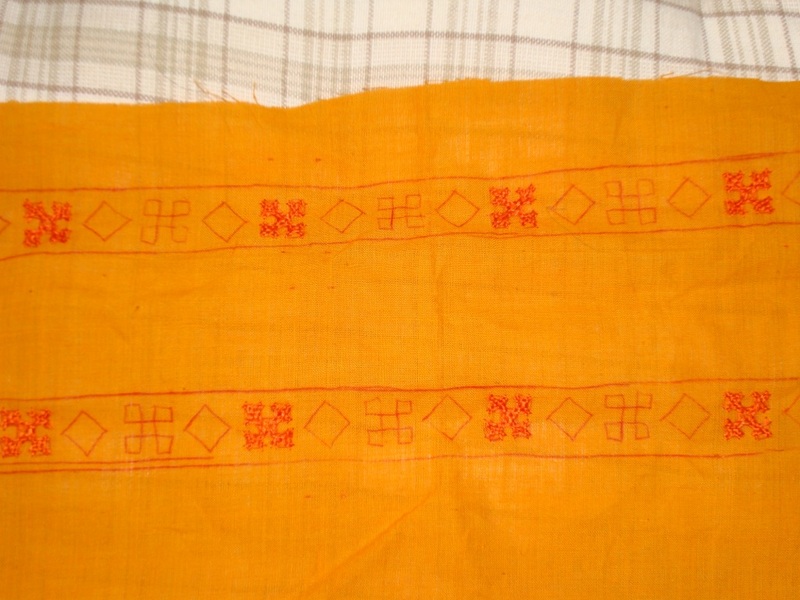 The centre is brown, then a printed fabric in orange , on which embroidery is not done. 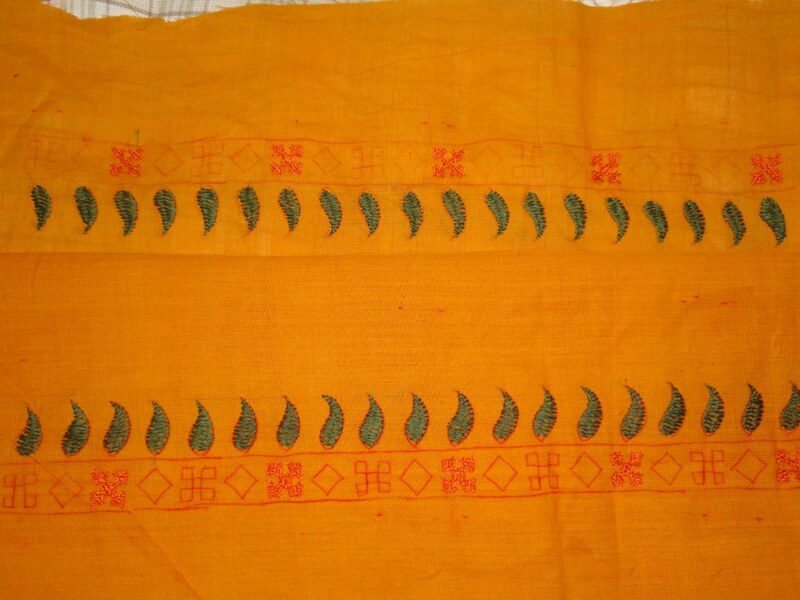 Then a yellow fabric, where a border pattern is done with sequins. 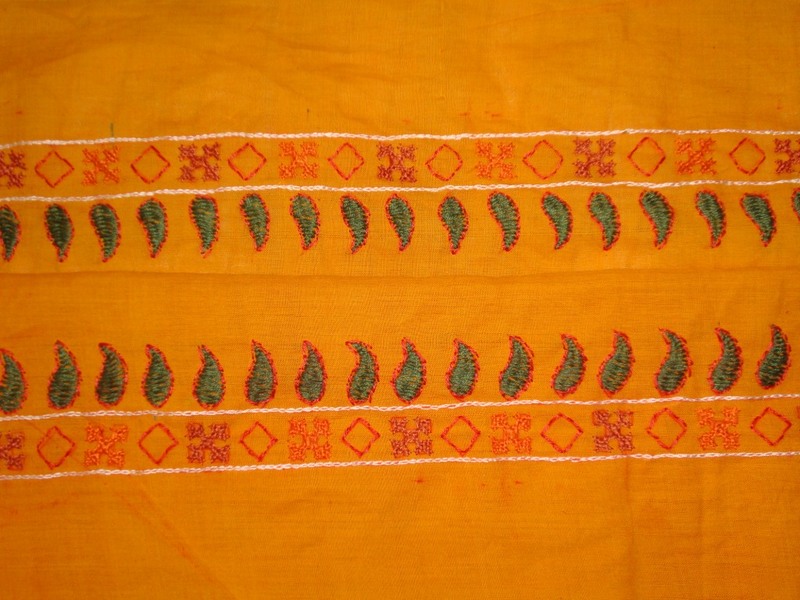 Continuing with the details on the brown fabric- two lines in chain stitch with yellow thread was done previously along with the kutch work motifs. Two more line are worked in chain stitch with variegated thread. The next step was to attach the sequins, which is completed in this picture , the mirrors will be stitched later. The same brown fabric is used for sleeves too. The border before attaching the mirrors. some more details on my next post. This time around, I wanted to do something new with the tunic yoke. 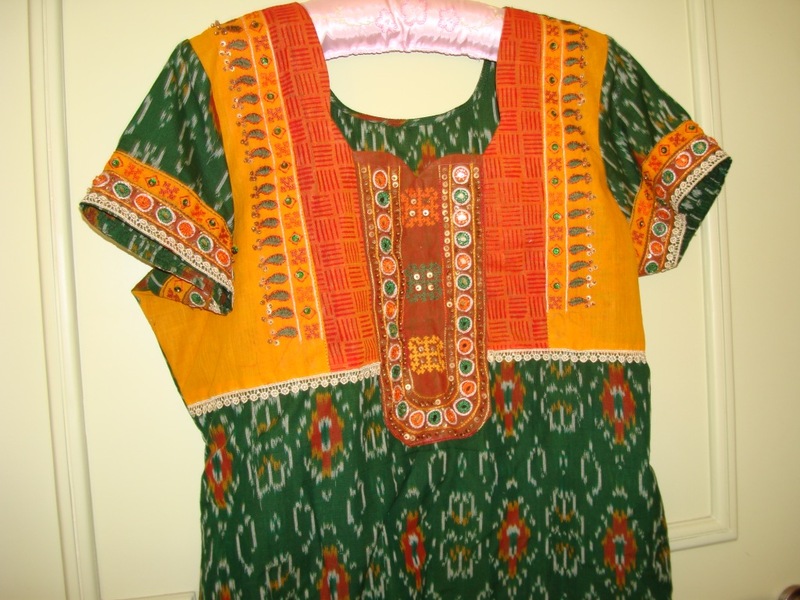 The patterns and embroidery were usual, but I used three fabrics for this embroidery on yoke and sleeves. 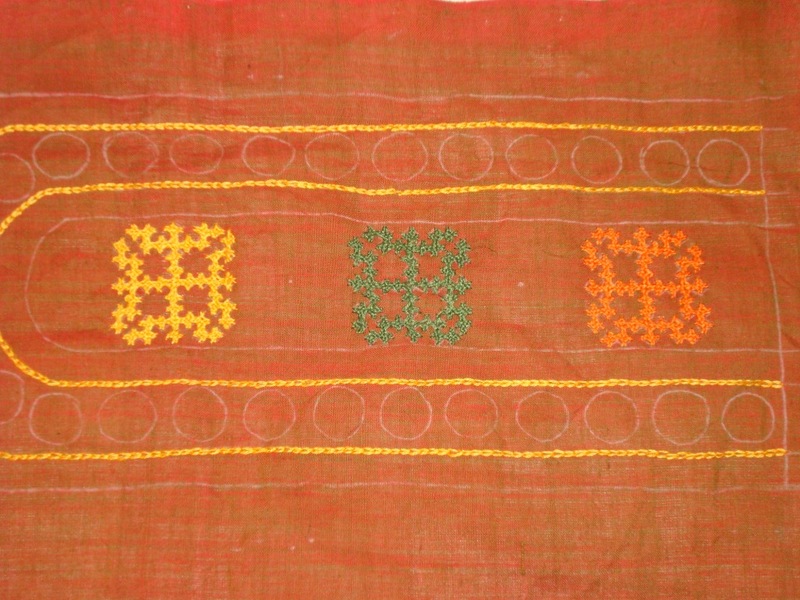 The tunic material was woven ikat cotton. 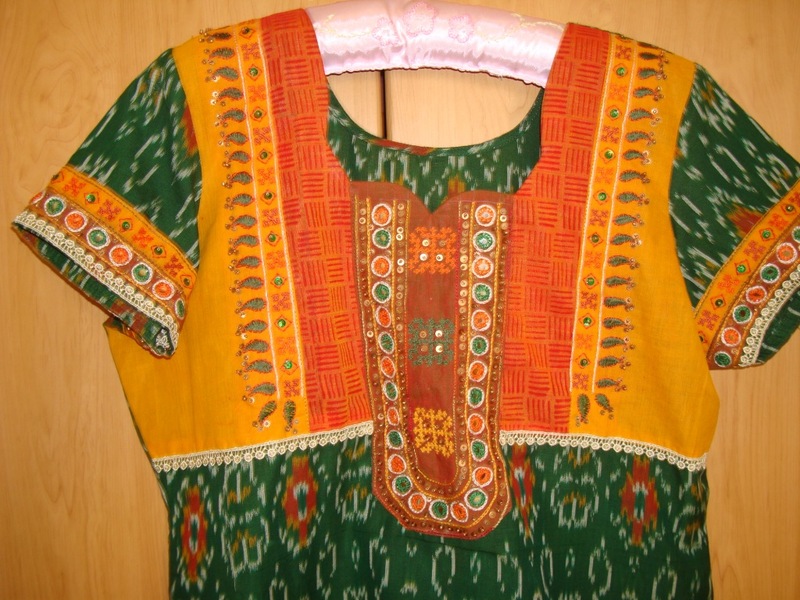 For this tunic, the yoke combination was brown, printed orange and yellow. 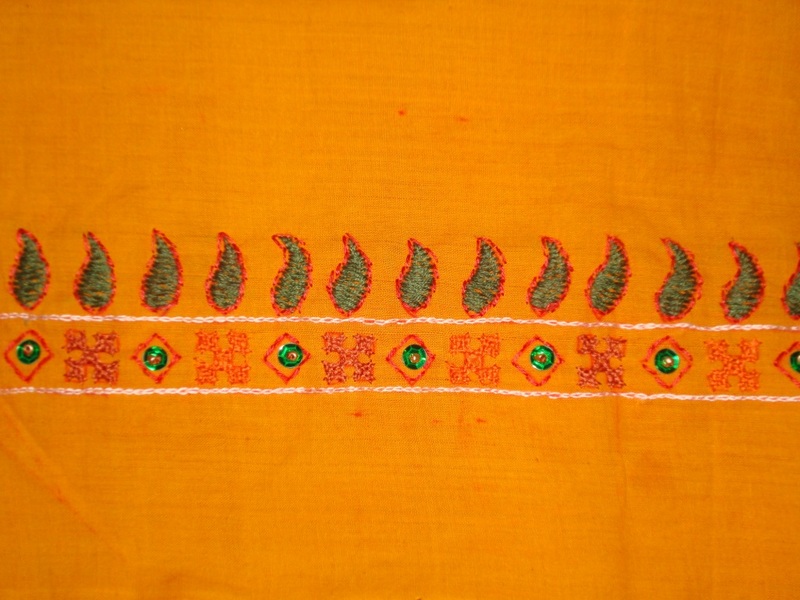 The embroidery was predominantly mirror work and kutch work with some sequins.